The US American Lindsay P. – who is of Norwegian ancestry and with genealogical links to the (former) Christensen shipping dynasty in Sandefjord – is taking a year at Stockholm University and spends some of her sparetime taking pictures of Swedish daily life for her blog. Lindsay claims that «This is not a photography blog, nor am I by any means a photographer», but, but she certainly makes a great effort! Some examples of her encounters with Swedish daily life: Tyrkisk pepper, killer slugs, her old Norwegian bike (!) and the wonderful city library. And what about Autumn apple tiramisu with salt brittle and cottage cheese, served with apple sorbet? I obviously missed the news of the book «The Prince and the Nanny. The Life of Prince Harald, now King of Norway, as told in Historical Context and through the Journal of his Nurse, Inga Berg» when it was published by Skandisk Inc. in Minnesota in 2008. But today I got hold of a copy of the second edition published this year. 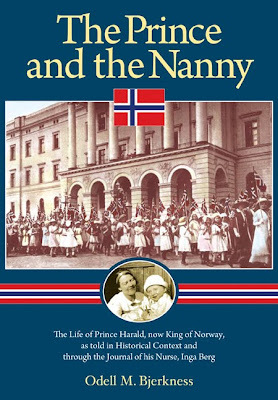 As the title suggests, the book tells the life of King Harald so far, but also gives many details about Inga Berg (1896-1983), who served as a pediatric nurse for the then Prince Harald for the first year and a half of his life. The book is built on the diary that she wrote during her time at Skaugum, the Crown Prince family’s estate in Asker outside Oslo, and gives nice glimpses of the first months of Prince Harald’s life. - Part III, the epilogue, completes the story of Prince Harald and Inga Berg, tracing some of the activities of the two families until the present. - The final part contains endnotes, a bibliography and appendices. The book is richly illustrated and especially enjoyable are the appendices, with among others the letter of recommendation written by Crown Prince Olav’s ADC, Nikolai Ramm Østgaard (1885-1958), information on vacation time compensation, Inga Berg’s personal invitation to the wedding of Crown Prince Harald and Miss Sonja Haraldsen in 1968 and «Excerpts of weight and milk charts, February 23-April 23, 1937»! It might have been told before in other books about King Harald, but now we know that he weighed 3170 grams at birth (about 7 pounds) and 4900 grams on 4 May 1937! The author, Odell M. Bjerkness of Edina, Minnesota, Professor Emeritus of Concordia College, Moorhead, Minnesota, is the son of Marie Berg Bjerkness, the elder sister of Inga Berg. He received the St. Olav medal by King Olav V in 1982 for his work in promoting Norwegian-American relations. Sunday 20 September 2009 was the last day of the exhibition of the Mandal artist Olaf Isaachsen’s paintings in the Blomqvist gallery in Oslo. But if you were unfortunate enough to miss the exhibition, you can still enjoy Isaachsen’s art by reading Tone Klev Furnes’ book «Olaf Isaachsen – Med livet som pamflett», which was published in late August 2009. The exhibition was opened on Thursday 3 September by former Norwegian prime minister Kåre Willoch, who descends from the Isaachsen family. Olaf Wilhelm Isaachsen was born at Mandal on 21 March 1835 as the second son of Daniel Peter Christian Isaachsen (1811-1882) and Cecilie Marie Wattne (1811-1895), and thus belonged to the Isaachsen-Willoch family’s branch 1 line 2, while Kåre Willoch descends from line 4. The architect Thomas Willoch, b. 1933, who for many years worked at the Royal Palace in Oslo as Palace Superintendent, belongs to the third line. Isaachsen was educated at an arts academy in Düsseldorf, Germany and was also an apprentice with the French artists Thomas Couture and Gustave Courbet. Isaachsen was one of the first Norwegian artists who after finishing his education decided to settle in Norway to live on his art. He struggled to get recognition in his lifetime, and after his death at Kjos in Kristiansand on 22 September 1893 he was for a long period a forgotten painter. Today Isaachsen is regarded as one of Norway’s most prominent artists and greatest colourists with motives from Setesdalen and the coast landscape of Southern Norway. Olaf Isaachsen married at Düsseldorf on 23 August 1864 Antonie Johanne Prehr (1838-1870), daughter of veterinary Wilhelm Heinrich Prehr and Jeanette Walther. The couple had four children – William (1865-1942), who emigrated to New Zealand; Eivind (1866-1926); Johanna Maria (1867-1872) and Harald (1869-1942). Only the latter continued to live in Mandal, but his children ended up in Oslo and in the United States. The author Tone Klev Furnes has also written other books about artists from Mandal. In 2000 she published «Amaldus Nielsen – kystens maler» and five years later she finished the book «Én by – fem kunstnere» («One city – five artists») about the artists Adolph Tidemand, Olaf Isaachsen, Amaldus Nielsen, Gustav Vigeland and Emanuel Vigeland. The article «Willoch (Isaachsen-Willoch)» in Norsk Slektskalender, 3rd volume, Oslo, 1979, pp.193-212. Lindesnes 19 September 2009 No. 217, p. 10. Updated Thursday 24 September 2009 at 22:10. Joe Kennedy II, son of Robert F. Kennedy, has in a statement tonight informed that he will not take part in the Massachusetts special election for Senate in January 2010 following the death of his uncle, Edward Moore Kennedy. See also The Boston Globe 7 September 2009. Hyannis Port is situated at Cape Cod in Massachusetts and is maybe first of all known for housing the Kennedy Compound and other Kennedy residences, which might become a museum following the death of Senator Edward Moore Kennedy. Hyannis Port is a great tourist destination and the second largest commercial fishing port at Cape Cod. In the village you will find among others the JFK Hyannis Museum, which mainly focuses on President John F. Kennedy’s relationship with Hyannis. 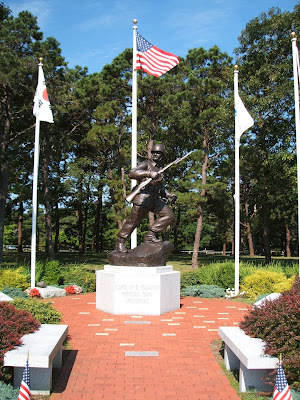 On the Lewis Bay waterfront you will also find the JFK Memorial (see top picture). Following my article «Royal blogs» last month, I have received several suggestions of other royal blogs that are worth mentioning. One of them, Royalblog.nl has already got a link from the European Royals Message Board . The blog is written by the Dutch journalist Hans Jacobs and gives a great summary of current royal events. Jacobs does not only focus on the European monarchies – in August you could for instance read about the King of Malaysia - or the Yang di Pertuan Agong to be more precise; King Mohammad II of Morocco’s need for a break or Jordan’s King Abdullah’s pilgrimage to Mecca. If you are particularly interested in the former monarchy of Romania, then you have to visit Diana Mandache’s Weblog of royal history. Mandache is an historian by profession and has a special interest in royal history, in particular Romanian royal history. She has published several books, including «Romania, Central Europe and the Balkans» (Pro Transilvania 1999) and «Marie of Romania. Images of a Queen» (Rosvall Royal Books 2007). From time to time she also pays attention to neighbouring Bulgaria. The article «KRICHIM palace. A disputed Bulgarian royal property» is a must read. The blog also provides some interesting links. One of them goes to Valentin Mandache’s weblog Via Pontica, which deals with Romania’s historic houses. Maybe not a royal blog, but it is very well done and makes me wish for another visit to Romania soon. If you have a general interest in Romania, the magazine Vivid, which Valentin Mandache has provided a link to, is also worth mentioning. Last month you could for instance read an interesting diary article by «Princess» Lia , the wife of HM King Mihai’s nephew Paul Philip Lambrino (or von Hohenzollern if you like). Lia Lambrino is certainly not a princess, but still something to spend a few minutes reading about. Perhaps a bit too self-centred, but then again that is what diaries are all about, right? «Princess Politics» is another blog focusing on focusing on royalty. I have no idea who the lady behind the blog is – why do people have to hide out like this? – but she seems to be living in the United Kingdom where she «ponders politics, economics and family - and seeks to escape the control …». And if you are not tired of royal blogs already, you will find a long list of links at American Monarchist.